If your preference is for a device that is not overly flamboyant, you get that in the Doogee BL7000. Business users, in particular, will appreciate the minimalist, slim design. The phone sports metal frame and its rear rocks textured leather feel. Doogee BL7000 packs a large 5.5-inch display by Sharp. With a Full HD resolution, you can look forward to great visuals on this screen. It appears camera is an area phone makers now prefer to compete for market share. The Doogee BL7000 offers you dual 13MP cameras by Samsung on the rear. The shooters line up vertically, with one above the other. One of this helps to create blur effect when you need it. On the front is another 13MP camera for selfies. Doogee says this one is also by Samsung. It is similar to those you find on the back and offers a Face Beauty feature. On the inside, the Doogee BL7000 packs an octa-core MediaTek MT6750T processor running at a maximum speed of 1.5 GHz. It comes with 4 GB of RAM and 64GB onboard storage capacity. For enjoyable gaming, an ARM Mali-T860 GPU takes charge of graphics crunching. The mobile phone boots Android 7.0 Nougat operating system, which is not a poor choice at all. A key selling feature of the Doogee BL7000, which also seems to have something to do with its name, is the battery. This weighs in with a capacity of 7060 mAh! The phone maker says this will last about one month and a week in standby mode. It supposedly lasts almost 16 hours of 3D gaming. There is also support for 12V-2A fast charge technology. You get to enjoy access to multiple 4G LTE bands on the device. Doogee BL7000 offers dual Nano SIM slots. There is also a fingerprint sensor that unlocks in 0.1s and is able to identify your finger regardless of how you place it. Doogee BL7000 is not officially available in Nigeria, but you may be able to buy the phone from a third party seller at Jumia. The price starts at $159.99 at Banggood. 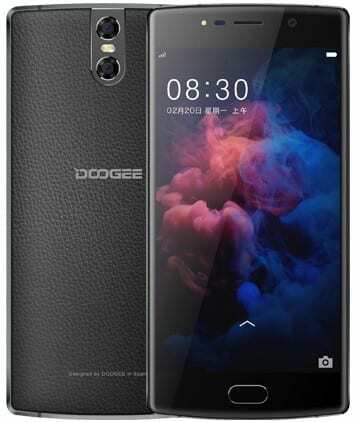 Doogee BL7000 Price in Nigeria is expected to range from 60,500 Naira to 110,000 Naira depending on your location in Nigeria.